We teach artistic singing…..and so much more! Confidence, Character Skills, Leadership, Teamwork, Helpfulness, Perserverance. Children have been learning excellence in music and character in the Roanoke Valley Children's Choir for 32 years. Please donate to help our choir expand and grow. With your help, our goal this year is to raise $12,500! Every bit helps, but here is what we can do with the money we raise. The RVCC is directed by Kimberly Davidson, whom is also the administrator. There are 2 full-time employees (including the director) and 2 part-time employees. The RVCC is supported by 31 volunteer committees, who do everything from taking attendance and chaperoning on trips, to organizing events; and they make our group SPARKLE! The director, Kim Davidson, is proud for this choir to be her life’s work. The goal of the choir is to teach children about beautiful music, excellence, and working together, while creating lasting bonds of friendship and accomplishment. We are very proud in the RVCC to have had choirs sing at National Christmas Tree Lighting ceremonies in Washington D.C. for past presidents, in London at Canterbury Cathedral, In New York at Carnegie Hall, at national and regional children’s choir conventions (ACDA), and also at two concerts each year at the Jefferson Center in Roanoke, VA. It is amazing to see the singers work hard to create beautiful music, make lasting friendships and bonds, and have meaningful memories they will never forget. It’s great to see them thrive in this, enjoy it, and take what they have learned into college and the rest of their lives. Please consider donating to help support the Roanoke Valley Children’s Choir. Thank You! Sing with the knowledge of the Lord’s love, given to each of you, in your hearts. Thank you for instilling in me the love of music and singing at a young age! Give A Smile And A Song! We appreciate your donation. 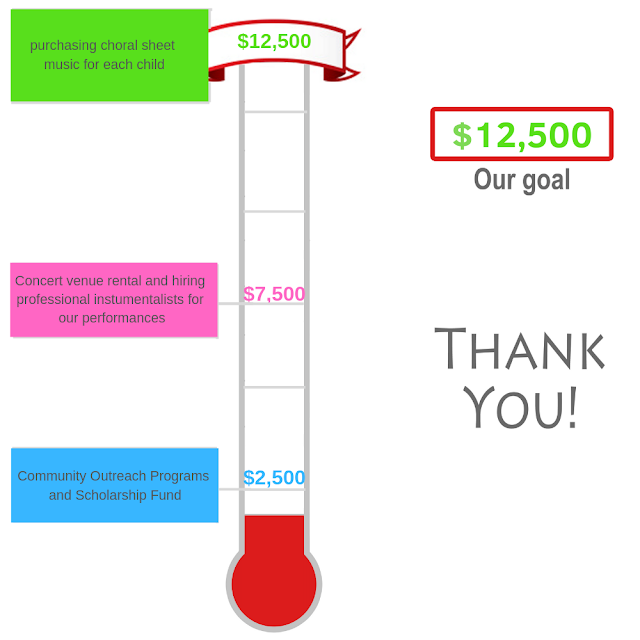 Each tax deductible donation goes towards our overall goal. Summary: The Roanoke Valley Children's Choir (RVCC) is a choir for young singers ages 7-18, located in Salem, VA. The choir operates as a 501 (c)(3) non-profit organization. The choir currently consists of about 240 children, 7-18, from across the Roanoke Valley. There are 4 choirs that span the age range; A, B, B+, and C Choirs.